2019 Adelaide Festival. Young Vic and Isango Ensemble. Royalty Theatre, Adelaide. 5-11 March, 2019. Another wonderful night at the theatre at the 2019 Adelaide Festival with the musical adaptation of Jonny Steinberg’s biographical A Man of Good Hope. This modern African musical sometimes felt like an opera, mainly due to the sheer majestic power, range and depth of the beautiful and glorious singers and performers from the Isnago Ensemble, South Africa. This is another inspiring political play, part of the relatively unique and dominant theme of this year's Adelaide Festival. The work is about human survival, endurance, and independence. In this case, the focus is on being a member of a particular ‘tribe’. Whilst being a member of this ‘tribe’ may be of vital importance in this epic African story, nonetheless, being free and independent is also equally important. 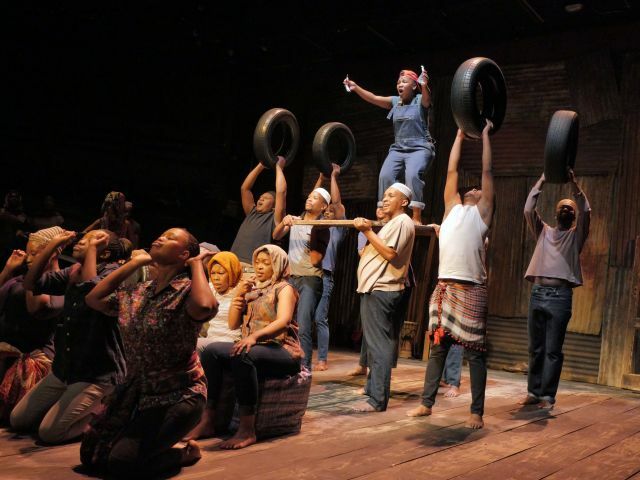 Devised and performed by South Africa’s internationally celebrated and award winning Isango Ensemble, directed by Mark Dornford-May, A Man of Good Hope is based on the real life story of Asad Abdullahi. 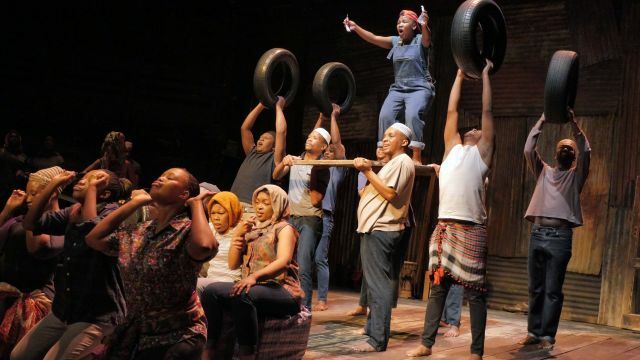 Orphaned and abandoned when he was 8 years old during the 1991 Somalia Civil War, his survival and subsequent life was the subject of Jonny Steinberg’s book, and is now this marvelous new African musical. Three actors play Asad, starting with young and engaging Siphosethu Hintsho as 8-year-old Asad. Thandolwethu Mzembe then plays Asad as a charming and ambitious young man, successfully operating as a kind middleman to various ‘tribes’, marrying the woman of his dreams, then embarking on a perilous journey in search of wealth to far-distant South Africa. Ayanda Siyabonga Tikolo plays Asad as a mature man, running a shop in a poor ‘black’ community outside Cape Town. Divorced by his first wife, he is ostracised by his ‘supporters when he marries a woman from a different ‘tribe’. He longs for an entry permit to the USA. Throughout this story there is a strong and reoccurring emphasis on being a member of a particular ‘tribe’. This is highlighted by the story being told in Xhosa as well as English. The Xhosa are the second largest cultural group in South Africa. For most of his journey the reason Asad is able to survive is because he is a member of this ‘tribe’. However, this too eventually becomes intolerable, particularly after he marries his second wife. This epic journey is essentially about being ‘self-reliant’ and independent from all racial, cultural, historical, and family ties that have become toxic. This is an extremely bold and impressive stance to take, particularly considering modern sensitivities in regards to ‘identity politics’ and the perceived necessity of ‘belonging’ to a community. When the ‘tribe’ to which one belongs become violent and abusive what other choice does one have but to abandon that ‘tribe’ and start again? If you do go see this exceptional show, and I sincerely hope you do, then one thing that may give added meaning is to familiarise yourself with a map of Africa and a rough idea of the various 'tribes' each with their own unique cultural identity - at least in regard to Somalia. Kenya, Tanzania, Nigeria, Ethiopia, Zimbabwe and South Africa. This is particularly the case in reference to Azard’s epic journey from Somalia to South Africa. This journey is told in a truly dazzling sequence that involves the entire ensemble singing and dancing in rapid sequence the respective different cultural and ethnic groups that Asad travels through. This includes respective ‘tribes’ from Somalia, Kenya, Ethiopia, and Zimbabwe, climaxing with a kind of Zulu warrior dance as Asad approaches South Africa. It is brilliant. However, despite the positive title, the terrific singing and dancing, and the exuberant, energetic and fabulous performances by this wonderful ensemble, A Man of Good Hope ain’t no Lion King. This is a serious piece of political theatre. Asad’s ultimate rejection of his country and his people is a very bold socio-political statement. It can be taken as a reflection of the current disillusionment in post-apartheid South Africa. This point is raised numerous times by the performing ensemble. Racial tension, anger and frustration continually spirals into violence from which Asad continually desires to escape. In one telling scene in a poor ‘black’ town outside Cape Town, Asad and his fellow Somalian ‘refugees’ are subject to the violent tirades of a group of incensed ‘black’ South Africans who claim that ‘foreigners are taking our jobs’ and corrupting society. Sounds familiar? The reaction from the essentially ‘white’ affluent middle class audience of which I was member was a sombre silence. This may be an all ‘black’ cast from Africa but in this instance they were us, and it was scary, because such inhumane violence breeds more violence. Survive Asad does. Why? Because essentially he is The Man of Good Hope. He possesses the one thing that is absolutely necessary – hope. This is something in which he never falters, and it is inspirational. I thoroughly recommend this stunning production. It is raw, bold, always engaging, and challenging. A story about the vital importance of hope as told by the magnificent Insango Ensemble.